Emergency response teams are the front line of the Environmental Protection Agency (EPA) Emergency Response Program, which is in turn at the center of the national infrastructure for responding to environmental hazards such as oil spills. The Emergency Response Program brings together a wide range of activities directed toward ensuring appropriate, timely responses in the event of an emergency involving the release of oil or hazardous substances. After state and local first-responder capabilities have been exceeded, emergency response teams provide additional support to see that all hazards are dealt with in accordance with federal guidelines for the safety of human populations and the natural environment. 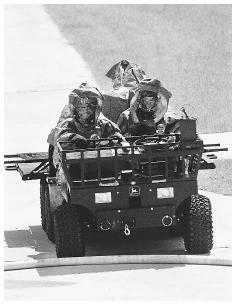 An emergency response team heads to the site of a mock biological threat during a bioterrorism training exercise at Camp Blanding, Florida in 2002.
reporting environmental hazards and other related public emergencies. Linked to the Response Center is the National Response Team, an interagency group co-chaired by EPA and the Coast Guard. Just as there is a national infrastructure for hazard response, with EPA as a key component, there are guidelines governing the response at the state and local level. This is especially important because in a real-world situation, the personnel most readily available to assist on the scene will likely be local authorities and not functionaries dispatched by Washington. Local community responses to environmental hazards are guided by the Emergency Planning and Community Right-to-Know Act or EPCRA, passed by Congress in 1986. EPA plays a key role in administering EPCRA, which groups federal agencies into 12 functional areas (for example, Hazardous Substances, which includes EPA) for emergency support. The National Response System. Each year within the United States, there are some 20,000 emergencies that involve the release, or the potential release, of oil, toxins, and other hazardous substances. While local firefighters, emergency personnel, and police occupy the most visible role in responding to these emergencies, they are supported behind the scenes by the National Response System, in which EPA again is a key player. The National Response System is designed to act quickly and effectively in emergencies involving oil and hazardous substances. A multi-tiered network, it involves representatives of not only local, state, and federal governments, but also industry and other groups whose knowledge and equipment are necessary to address a chemical threats to human safety and the environment. The National Contingency Plan. Guiding the National Response System is the National Contingency Plan (NCP), also known as the National Oil and Hazardous Substances Pollution Contingency Plan. Described by EPA as a federal blueprint for emergency responses, the NCP evolved over the final third of the twentieth century, as the leadership of the United States and the industrialized world became increasingly aware of the threat that oil spills and accidental releases of chemicals could pose to societies. A 1967 oil spill caused by the sinking of the tanker Torrey Canyon, which dumped more than 37 million gallons of crude oil off the British coast, prompted the development of the first NCP in the following year. Observing the massive damage with which their British counterparts were faced, U.S. officials sought to achieve a system for reporting of accidents, containment of spills, and cleanup of affected sites. The system was designed to include a response headquarters, a national reaction team, and regional teams. These teams were the forerunners, respectively, of the national and regional response teams. The congressional passage of the Clean Water Act in 1972 led to the revision of the NCP in 1973 to incorporate a plan for the response not only to oil spills, but also to hazardous substance spills. In 1980, Congress passed the Superfund legislation, or the Comprehensive Environmental Response, Compensation, and Liability Act. As a result, the scope of the NCP grew to include the release of substances at hazardous waste sites where emergency removal actions are required. Passage of the Oil Pollution Act of 1990 prompted more changes to the NCP in 1994. The Emergency Response Program. The principal aims of the Emergency Response Program are to take necessary steps toward the prevention of oil spill and hazardous substance emergencies; to prepare local, state, and federal emergency response personnel to deal with such situations; and to respond in a timely and effective manner to incidents as those arise. The Emergency Response program involves coordination of the ten superfund regions into which the nation is divided geographically, and of five EPA organizations. The latter include the Office of Emergency and Remedial Response, which directs domestic emergency responses; the Chemical Emergency Prevention and Preparedness Office, which oversees responses to chemical emergencies; the Prevention, Pesticides, and Toxic Substances program, which mobilizes community resources; the Radiation program; and the Office of Underground Storage Tanks, which protects against the release of petroleum from underground tanks. An example of the EPA emergency response teams at work alongside their counterparts from other federal agencies occurred in the aftermath of the September 11, 2001, terrorist attacks, when the EPA sent more than 200 personnel to the World Trade Center and Pentagon sites. Among their ranks were specialists whose roles are not commonly associated with EPA in the public imagination, including criminal investigators, forensic scientists, and technical experts. An Overview of the Emergency Response Program. Washington, D.C.: U.S. Environmental Protection Agency, 1992. Hogue, Cheryl. "Regulators at Scenes of Attacks." Chemical & Engineering News 79, no. 39 (September 24,2001): 11. Wallgren, Christine. "EPA Team Does Its Work Behind the Scenes." Boston Globe. (August 1, 2002): 1. Emergency Response Program. U.S. Environmental Protection Agency. < http://www.epa.gov/superfund/programs/er/ > (February 23, 2003). U.S. National Response Team. < http://www.nrt.org/production/nrt/home.nsf > (January 22, 2003).